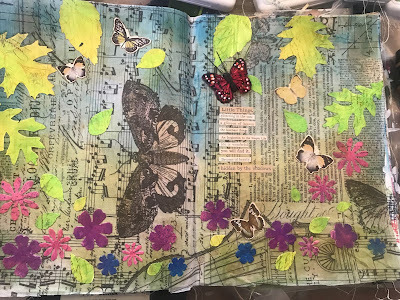 I've done a few garden-related pages in one section of my Dina Wakley Media Journal recently - I shared "Beautiful Garden" recently - so I wanted to do a kind of "title page" of sorts, that was a welcome to the garden-section of the journal. I chose to use the kraft process paper pages for their strength and colour and even though I covered them with tissue paper and then layers of Archival Ink, it's still possible to see the lovely tone of the kraft underneath it all, and it adds a "ground" to the whole piece, as well as muting down some of the background colours and making them more earthy, which allows the collage pieces to really shine. 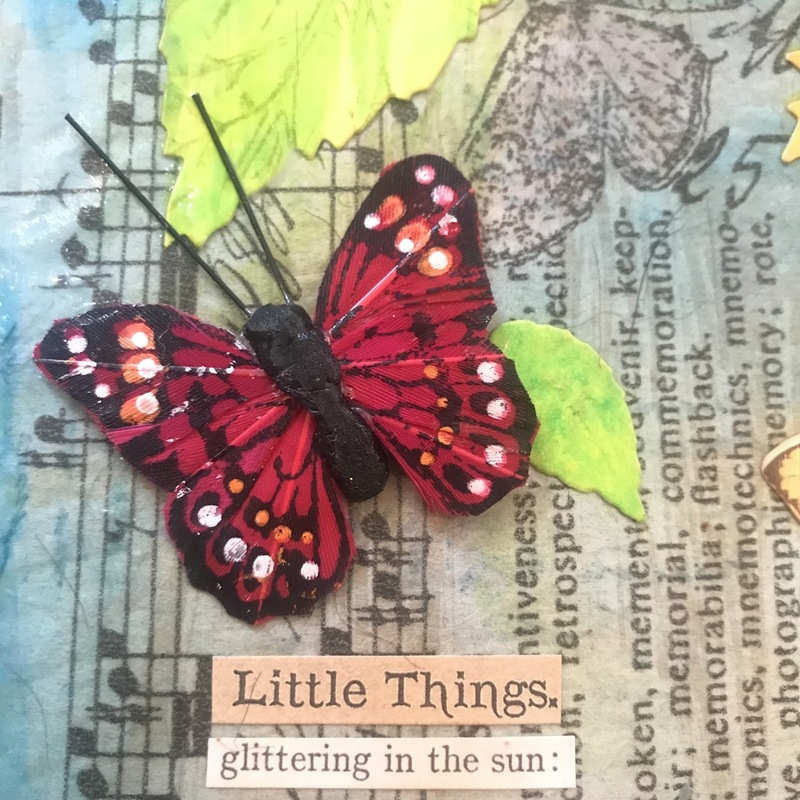 This layout was in part inspired by the names of the colours in Wendy Vecchi's line at Ranger. It is also a kind of tribute to the incomparable work of Vicky Papaioannou, who is one of THE best mixed-media art journalers out there. 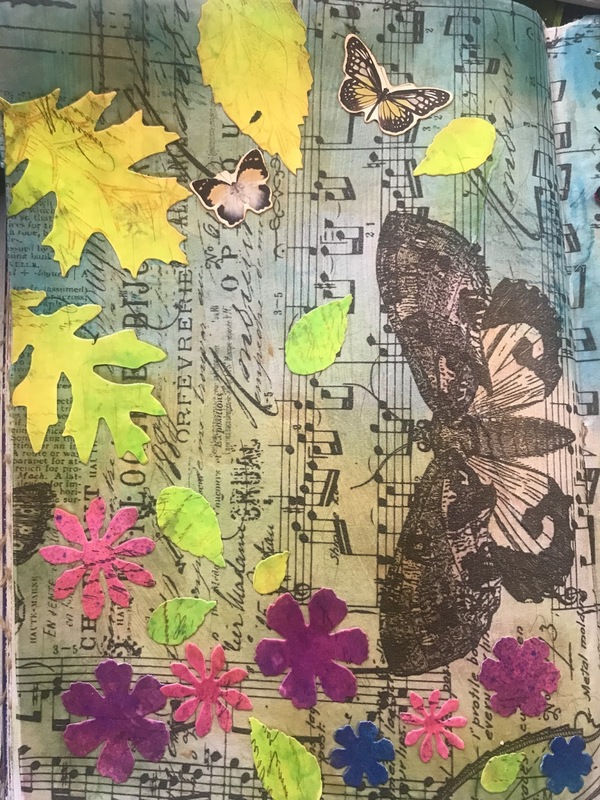 I've wanted to do a leaf-and-flower based collage for ages and I had just the dies to do it, which I'd not yet used - so it was pretty good fun. 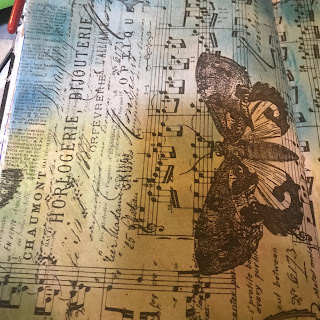 I used a lot of stamping and inking steps you could skip I guess, but they added detail, and I like my journal to look beautiful close-up as well as at a distance. 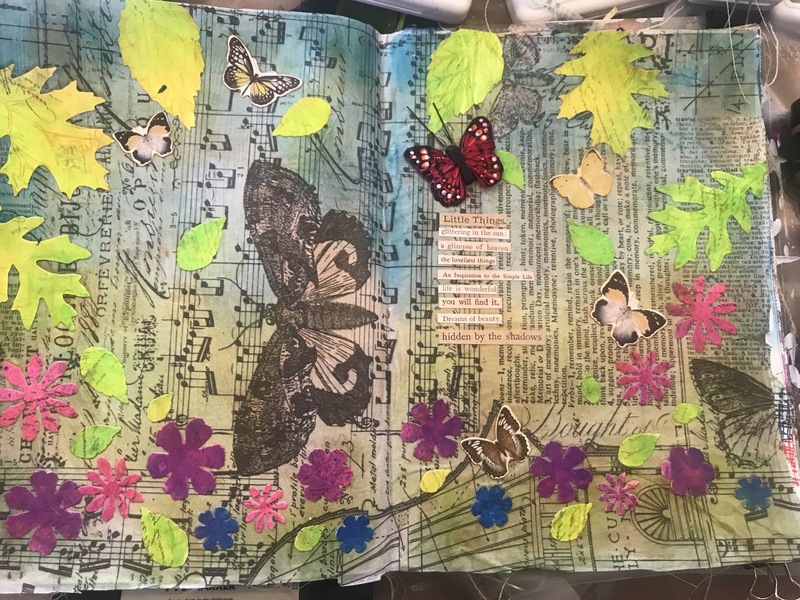 It is based on a flower garden surrounded by trees with leaves blowing in the wind and butterflies and moths visiting the flowers and reminding us that there is immense beauty in their simplicity. I also wanted the idea of an entrance and of looking through the leaves. This is kind of a "big" project, in that it uses a lot of different things, but they were all from my stash, and it did not take terribly long - it did have some drying steps, of course, and I actually did this over a couple of days, but the total "active" time was maybe 2h at most. The result is vibrant and beautiful and I love it. You don't need to have all of the Dylusions Ink Sprays for example - you could use watercolour paint or markers or whatever you have, and you can use any suitable dies, or just cut things by hand - use what you have. NB: the USA link points to a similar product as the OASIS brand was not available. STEP 1: I applied tissue wrap to the journal pages using the stiffer taklon brush and matte Collage Medium and then put fold-back clips around the edges of every page to weight it down and help it not curl. 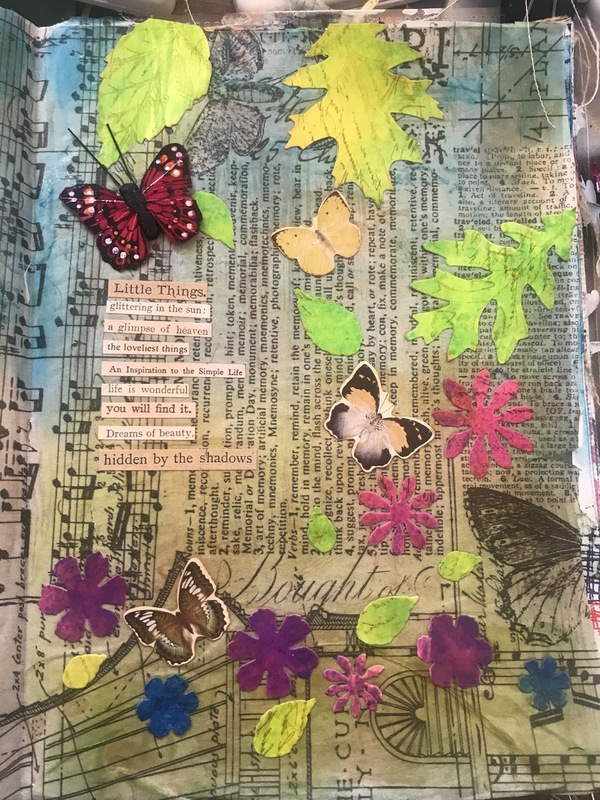 I left it to fully cure for a day or so and then cut off all the excess paper with scissors, which I kept for use in collage projects. I applied more collage medium if there were any edges that were loose. You need to keep the fold-back clips in place through the whole project - they should be applied so the clip-y bit is just on the very edge of the paper - they're there for weight rather than to hold things together. Remember when inking to move them around a little so as to avoid gaps. 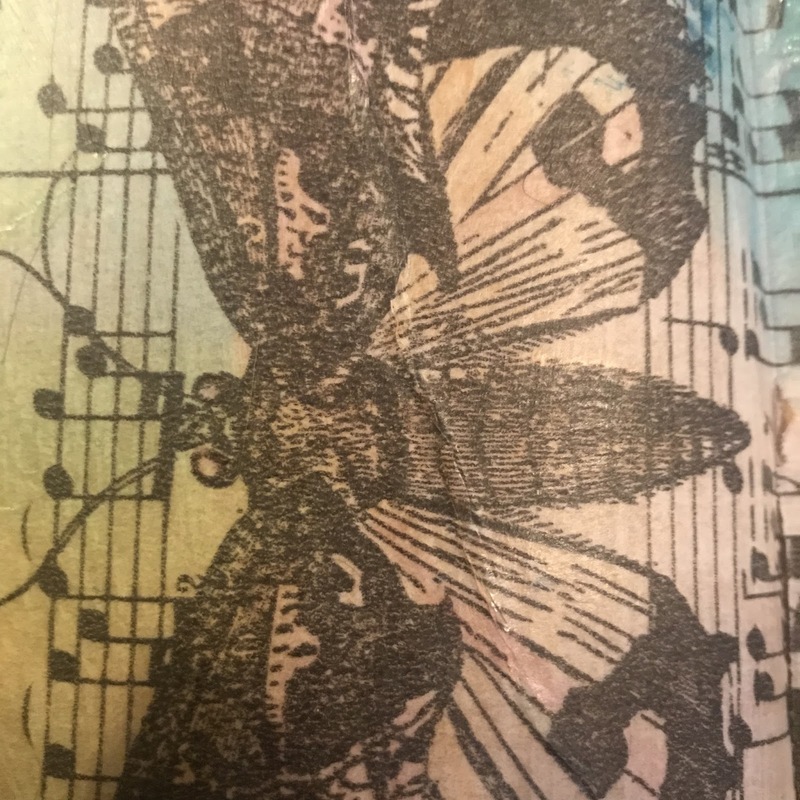 I chose this particular tissue because the pattern has moths which match my theme but also has music and that fits the idea of listening to Gaia and working with the planet, which are very much in my ethos, and I love this paper as it's not coated, so it takes ink really well. STEP 2: I prepped one tag to be cut into leaves ("the leaf tag"). I sprayed it all over with Lemon Zest and then added Vibrant Turquoise, which produces a dark green, followed by Fresh Lime to lighten it. 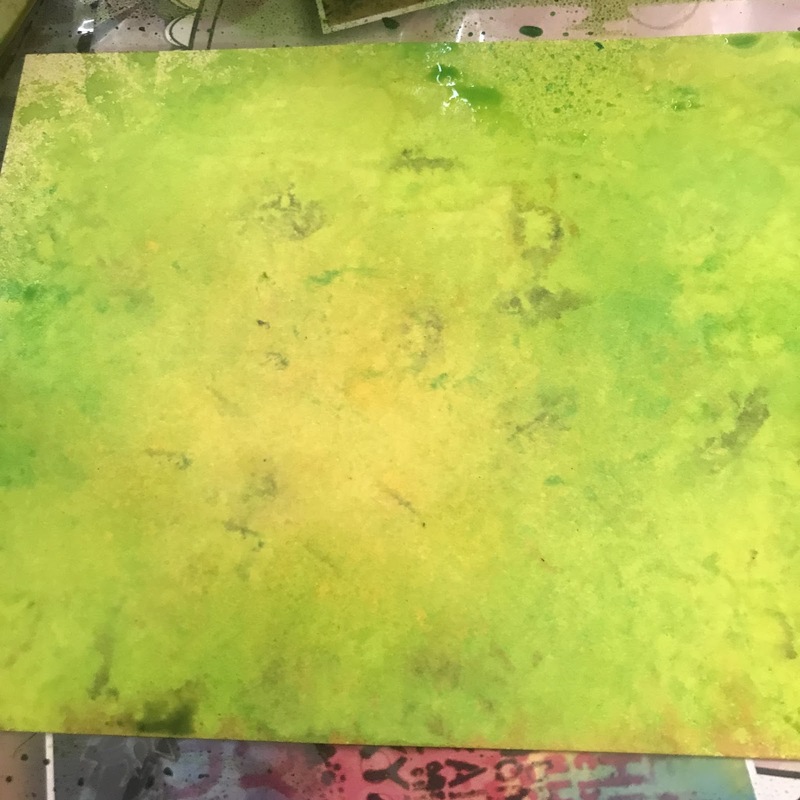 I blotted it with scrunched paper towel that I'd used before so that the various types of Art Dirt™ on it would transfer over and add some dark flecks for texture. 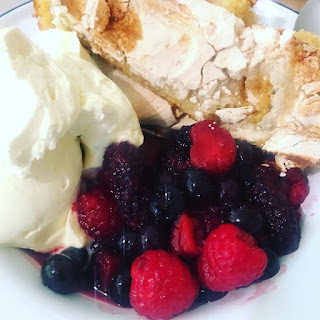 I then sprayed Vanilla Custard in two patches to create some lighter, warmer tones (the large warm yellow patch in the image above). I blotted that and left the tag to dry fully. STEP 3: I prepped a tag to be cut into three types of flowers ("the flower tag"), so I made half blue, half pink and the overlap became purple, so I could have three colours of flowers. To do this, I sprayed one half with Rose Quartz and then Bubblegum Pink in one patch and then just a little Pomegranate Seed before blotting as per STEP 2. I then sprayed the other half with Vibrant Turquoise and London Blue followed by After Midnight and the lightest touch of Pomegranate Seed so that it would have just a little colour-continuity with the other half. I again blotted it in the same way, and left it to dry. 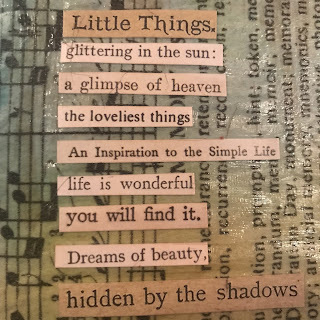 STEP 4: To add more texture, I stamped the mirrored script stamp from the Reflections stamp set over parts of both tags, very roughly so it would not really stamp well and not using a block. I used Archival Ink as it won't budge and has great colours. 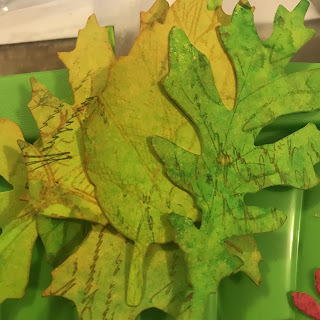 For the leaves tag, I used Leaf Green and Library Green, both applied to the stamp at once. For the flowers tag, I used Forget-Me-Not, Garden Patina and Cactus Flower, again, all applied to the stamp at the same time. I left the ink to dry for about 30 minutes before die-cutting. 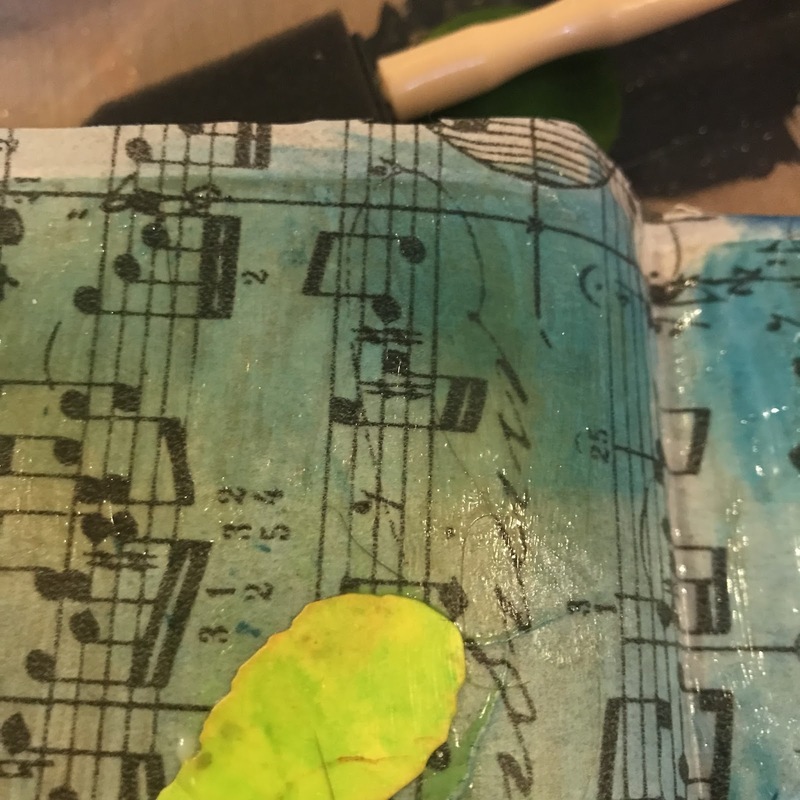 STEP 5: I used my blending tool to softly apply Leaf Green Archival Ink to the bottom 1/3rd or so of the tissue-covered journal pages - like grass. I then applied a region of the much paler Sap Green above it to give a lighter patch - like distant trees far away. I then used Forget-Me-Not for the sky and added some Manganese Blue especially around the top to create some darker patches. I used Tea Rose around the edges and over any gaps as it adds warmth and brings things together somehow. 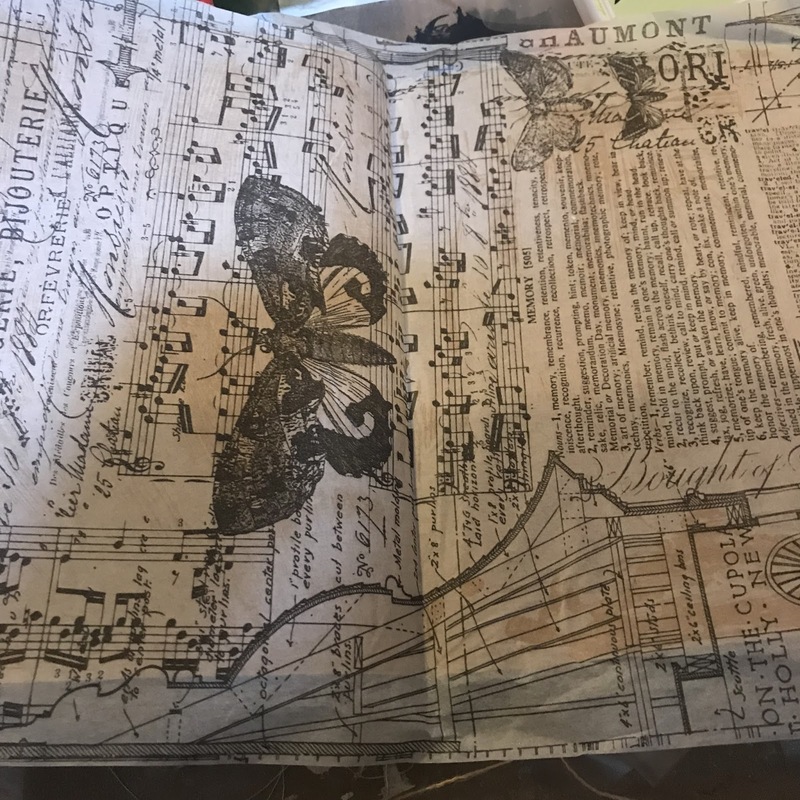 In this and all other steps, I tried to leave the large moth on the tissue on the left page clear of ink, so that I could use it for something later. Don't forget to move your foldback clips to apply ink where they were so you don't get white spaces. 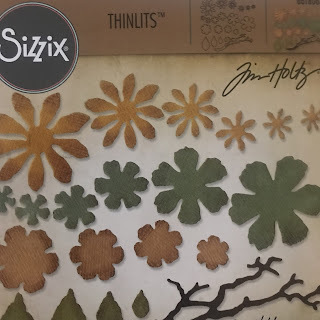 STEP 6: I die cut the Tattered Leaves Bigz die twice from the leaves tag and then used the leaves from the Small Tattered Flowers Thinlets die set to cut more leaves from the gaps - I had 6 big leaves from the Bigz die and probably 12+ small ones from the Thinlets. 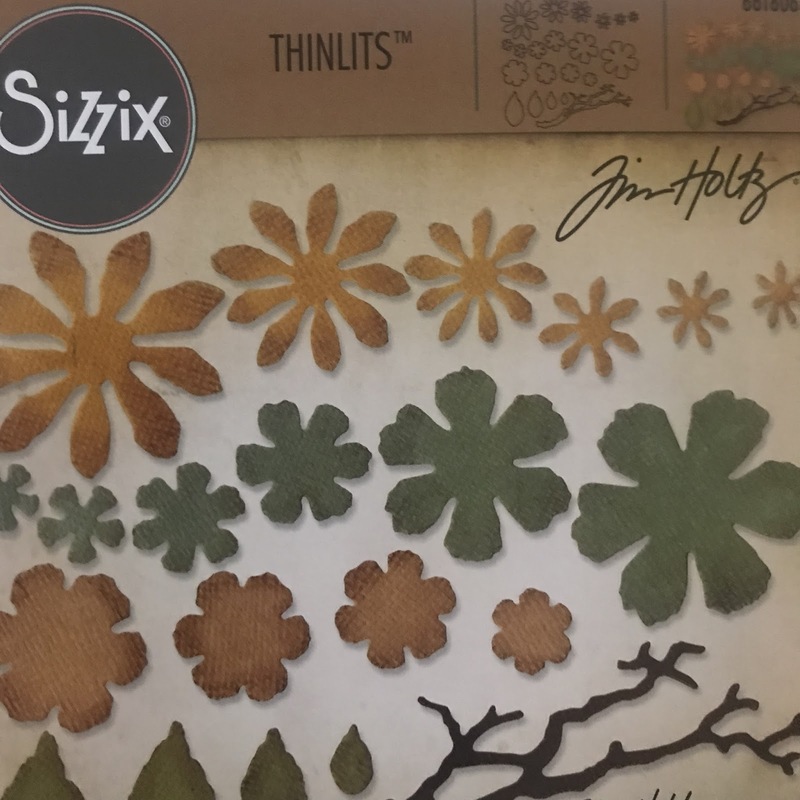 I then used the 3-4 largest flowers from each of the 3 flower types from the Thinlets set to cut flowers from the other tag. I tried to keep each one to either pink or blue or purple so that each flower shape was the same colour. 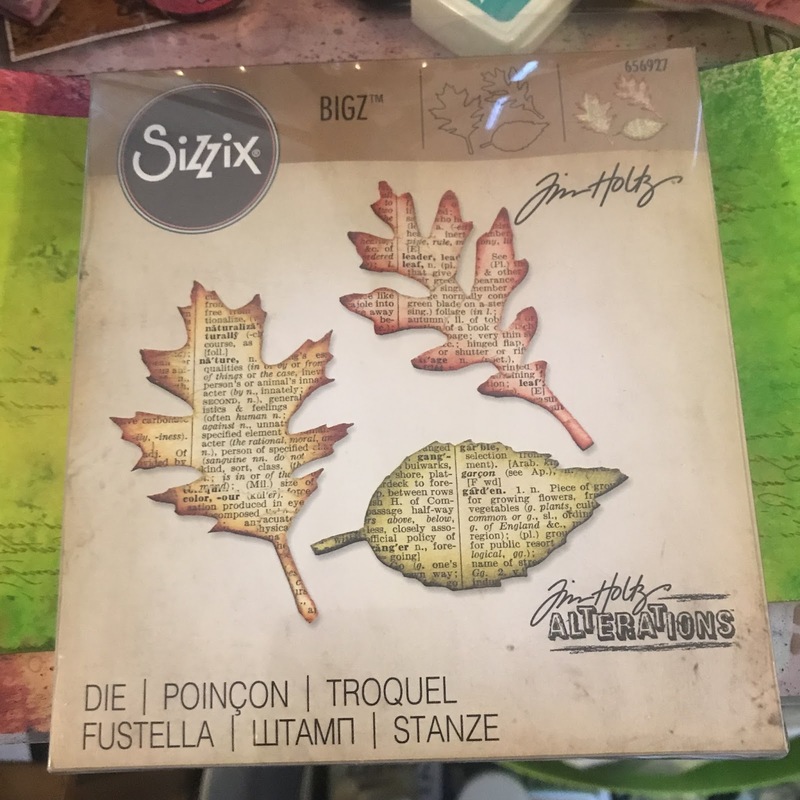 STEP 7: I used the Autumn Blueprints stamps to embellish my 6 leaves from the Bigz die. 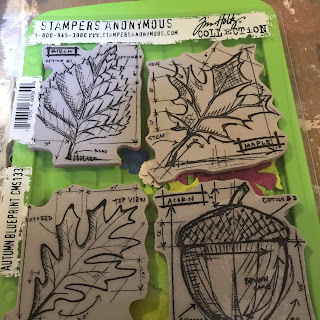 The Blueprints stamp set wasn't designed by Tim Holtz, it was actually his stepson MJ's work and it does bother me that the actual designers are never credited on the packaging. It has 3 leaves that don't quite match the dies but they match enough to add veins and texture. 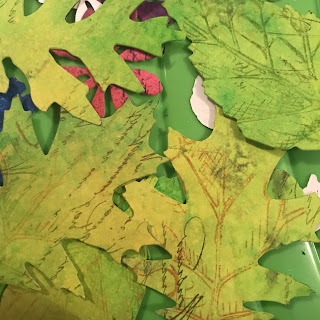 I separated my leaves into piles of "mostly yellow" and "mostly green". 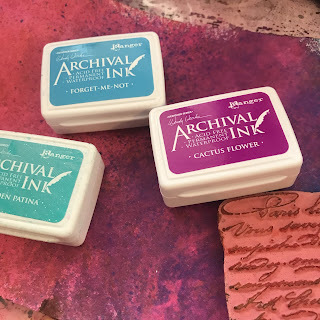 I stamped them all in Archival ink - the former with Dandelion and the latter with Leaf Green. 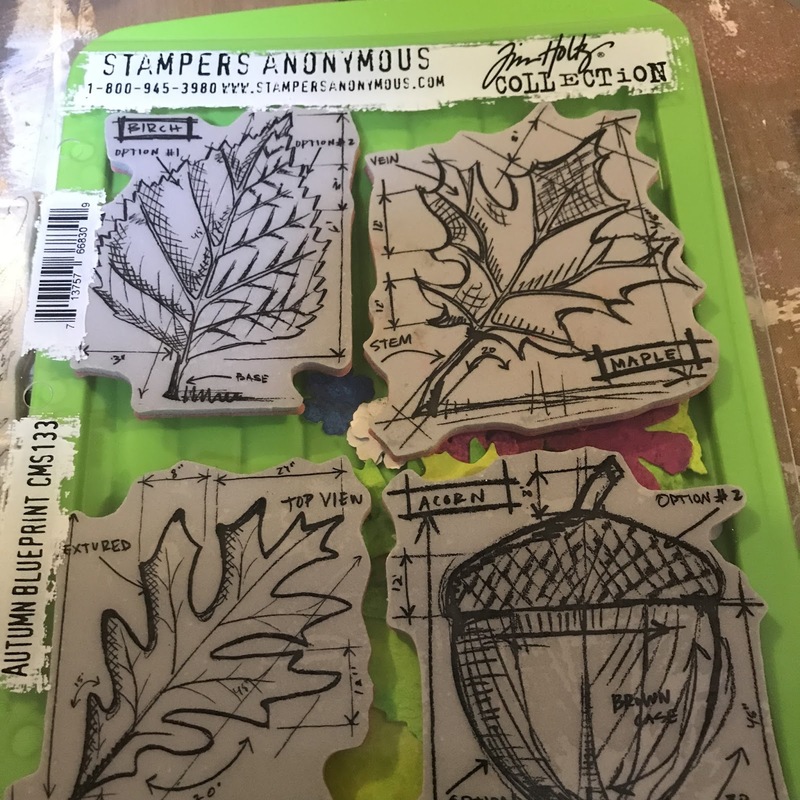 I did this by inking the stamps face-up on my worksurface and then placing the leaves onto the middles of them so that the stems and veins would be in the right place. I then left them all to dry. STEP 8: I went back to my background in my journal and used the same mirrored script stamp from the Reflections set to apply script in Manganese Blue, Library Green and Dandelion - all on the stamp at the same time - very, very lightly over various parts of the background. This was just to add a bit of visual continuity and is very pale and hardly shows in photos but you can see it in real life. STEP 9: I used Tea Rose ink on my blending tool to go over every leaf and flower to cover up the white/cream cut edges of the cardstock and to go over any uninked areas - this adds a lovely orange-y undertone and edge to them and echos the background, it seems to being things together for me. I love Tea Rose - it's just magical how it will soften and mute any colour without making mud. STEP 10: Collage time! Remember to always, always apply Collage Medium to both your leaf/flower and to the page and then stick wet-to-wet - if you don't, things will curl like crazy, and fall off. You also need to brush Collage Medium over the top of the item to seal it. 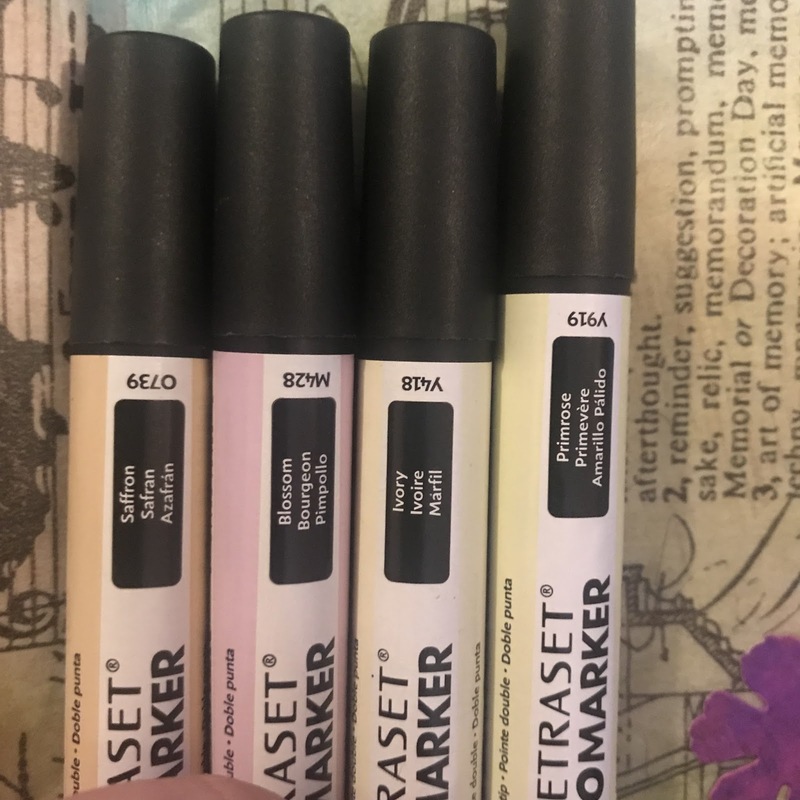 This is why I used such a soft brush, as the Dylusions ink WILL mobilise with Collage Medium and the softer the brush the better as it will minimise this from happening. 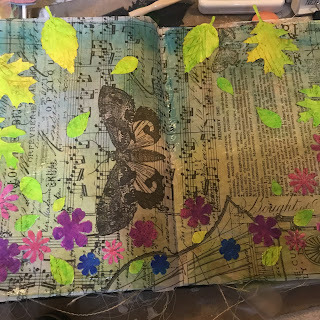 You need to work quite swiftly through this step - I applied larger leaves around the top and smaller ones around the sides and falling from the sky - again, avoiding that moth - and then I added the flowers around the bottom. STEP 11: After brushing Collage Medium over all of the stuck-down leaves and flowers using the soft brush, I kept going to cover the whole of both pages - this leaves the tissue non-permeable and gives it very different properties! 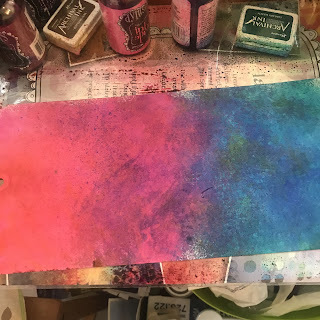 Whilst the Collage Medium was still wet, I did my College Medium Blend technique, which looks awesome! The trick here is that you need wet/starting to dry matte Collage Medium all over your project and wet matte Collage Medium on your brush. You then dip the bottom 1/3 of your brush into vintage College Medium (which is just Collage Medium with the Distress Vintage Photo dye added) and brush it into the medium on the page in various locations - some over the leaves, some just in the edges. Because you have so much wet medium on the page already, the vintage version is diluted down to give a much more subtle effect, which I prefer. Don't forget once this step is done, you need to wash that brush properly with soap and water! At this point the whole thing needs to be left overnight to dry out. 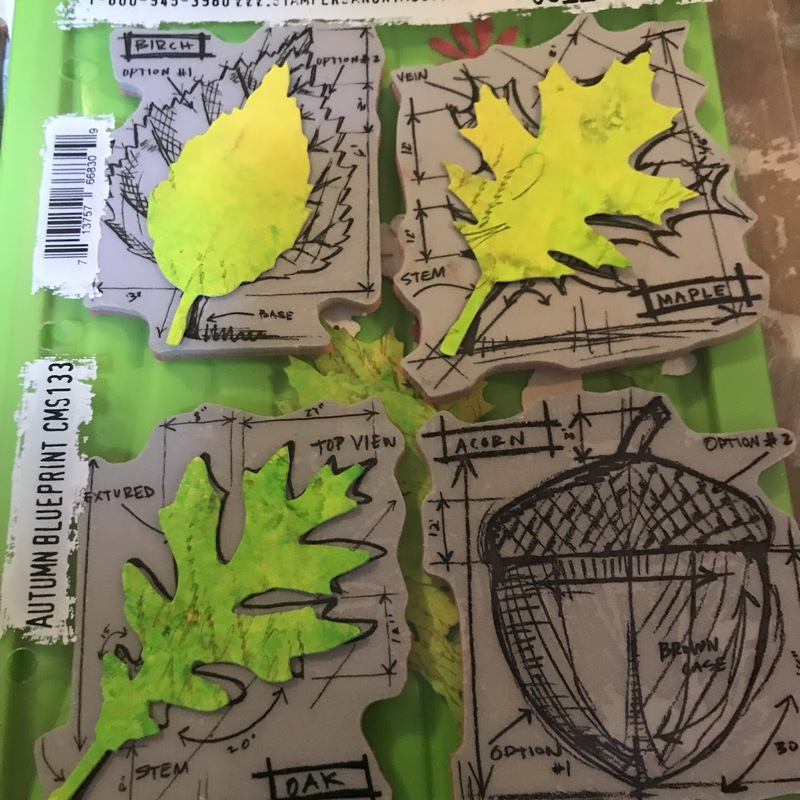 The next day, I went round the edge with scissors to remove the overhanging parts of the leaves, which I've kept for other projects. STEP 12: To the huge moth on the left-hand page, I applied Ivory ProMarker all over and then Primrose over most of it. 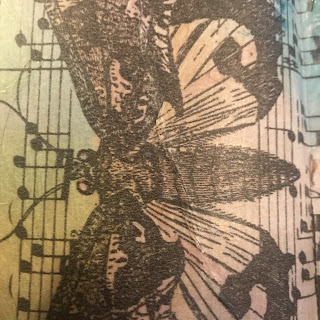 I used Primrose and Blossom to colour the various parts of the moth, and I repeated this over any other large moths on the background that did not have Archival over them. The dried Collage Medium will make the paper non-porous so alcohol markers will sit on the surface, just as they do on marker paper, which makes getting a really soft, pale look very easy - though they have to be left to dry thoroughly or will smudge. The overall effect is very subtle and pale and that is exactly what I wanted. 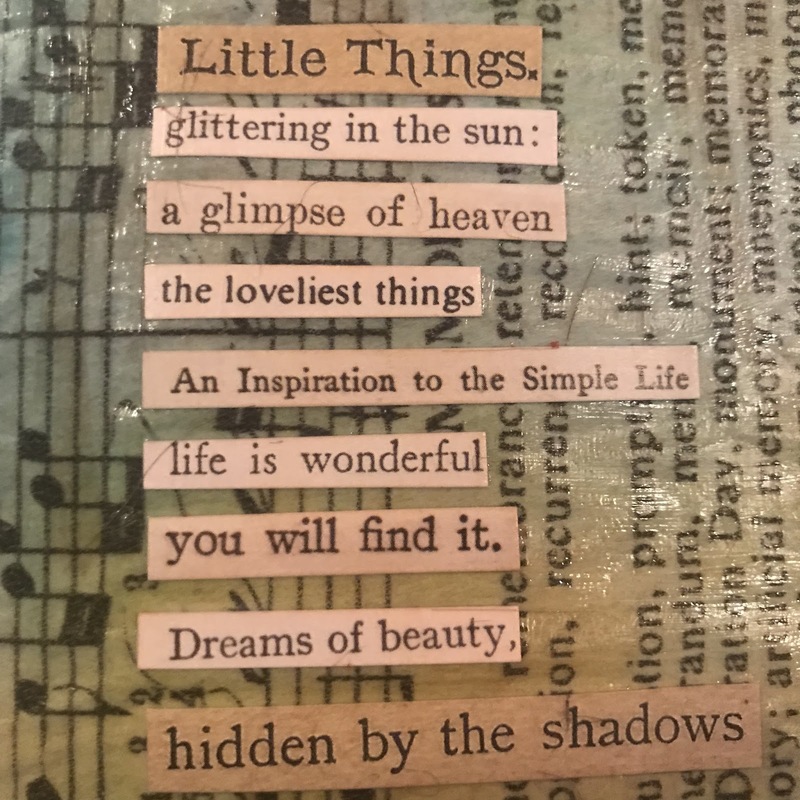 STEP 13: I selected phrases from the Clipping Stickers that produced a kind of a poem and applied them to the righthand page, then covered them with Collage Medium to ensure they stayed stuck. 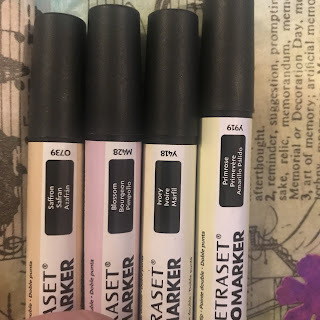 Once it was dry, I applied Tea Rose Archival Ink over them with my blending tool again, just to give some continuity with the page. 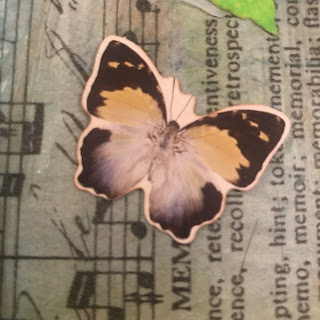 STEP 14: I selected 5 butterflies from the Layers Botanical pack and applied Tea Rose Archival Ink to each one - which is not easy as they have a glossy coating. I placed them around the layout and then stuck them into place with Vintage Collage Medium to subdue the white borders somewhat. I left them to dry and once dry, I applied a layer of Tea Rose Archival again, to soften. 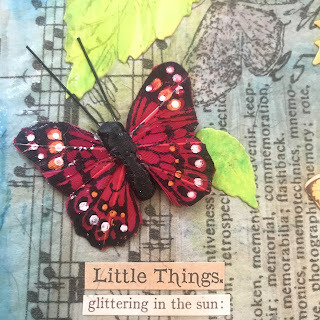 STEP 15: Finally, I took a red feather butterfly (cutting off the wire from the underside) and applied Tea Rose Archival Ink over the wings to mute them very slightly, and stuck it close to the poem/sentiment using Collage Medium all over the underside of the body and the edges of the wings. 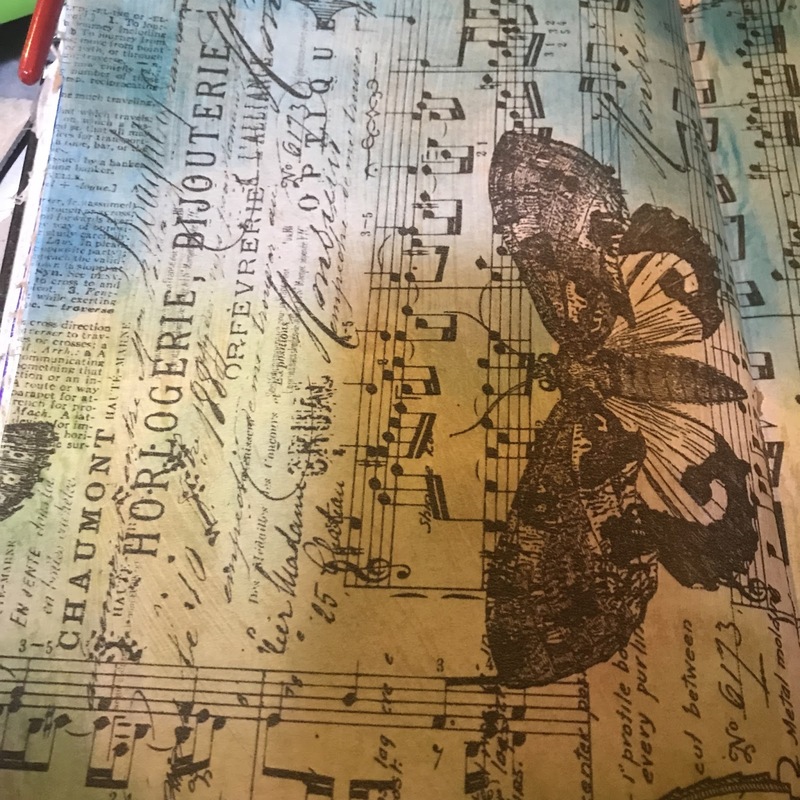 I then closed the journal and put a 1kg pot of gesso over the butterfly to weight it down to ensure it adhered properly.